Add all of the ingredients to the slow cooker except for the milk/cream, flour and stuffing. Cook on high for 4 hours or on low for 6 hours. About 30 minutes before the soup is done, combine the flour and milk and stir until the flour is dissolved and no lumps are remaining. Add the milk/flour mixture to the slow cooker and stir in the stuffing. Cook for another 20-30 minutes until the soup is thickened and the stuffing is done. Serve immediately. The soup will get thicker the longer it sits as the stuffing expands. Any leftovers the next day will be thicker as the stuffing expands. Add a little milk to thin it out when reheating. This comforting soup is hearty enough for a meal and easy to make in the slow cooker. Nothing says comfort like sitting down to a table spread with a Thanksgiving feast. A big turkey with perfectly browned and crispy skin, buttery gravy drizzled over fluffy mashed potatoes and stuffing, a variety of savory vegetables, sweet cranberry sauce, a side serving of marshmallow-slathered candied yams... the list goes on and on. We all have our favorite traditions that we like to bring to this annual autumn feast, but many of us think no Thanksgiving is complete without turkey, potatoes, stuffing and cranberries. 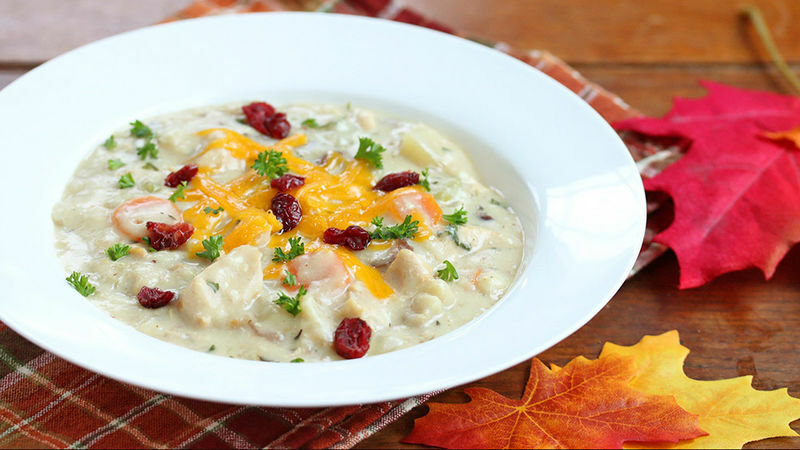 This creamy soup incorporates all of those Thanksgiving comforts in an easy "hands off" recipe that takes all the effort out of cooking. Simply dice up a few ingredients, throw them in the slow cooker, add a couple more ingredients at the very end, and there it is: A delicious turkey dinner soup. 30 minutes before the soup is done, combine the flour and milk and stir until the flour is dissolved and no lumps are remaining. Add the milk/flour mixture to the slow cooker and stir in the stuffing. Cook for another 20-30 minutes until the soup is thickened and the stuffing is done. Serve immediately. The soup will get thicker the longer it sits as the stuffing expands. Add a little more milk to the leftovers before reheating. For more delicious comfort food visit Kimberly's food blog, The Daring Gourmet.